Rise Casino will then reward you with a bonus (Welcome Bonus is for new players only). The terms and conditions of the bonuses vary between different casinos and might also change over time and between different countries, so it is important to compare the different offers and read the T&C for Rise Casino before signing up. 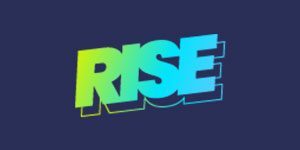 Neon vibes, youth and a retro atmosphere – that is what you get at the rising star that is Rise Casino! This brand new online casino launched just this year is owned by 888 Holdings Plc Casinos the UK Gambling Commission (UKGC) and Gibraltar Regulatory Authority. While still new to the market, Rise Casino knows exactly what the clients want, and goes an extra mile to bring that forward. In touch with the latest technological advancement and the speed of everyday life, Rise Casino enables its customers to play on the go all of the games in its mesmerising portfolio, allowing them thereby maximum convenience when gambling. As far as security and safety go, there is nothing to complain about – Rise Casino is audited and approved by eCogra, one of the biggest agencies whose duty is to check how secure an online casino is. 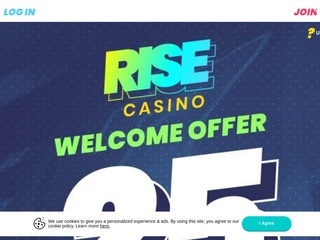 In addition, Rise Casino utilises the 256 bit Secure Sockets Layer (SSL) encryption, which caters for the safety of your private data that you share with the casino upon registration. On the flip side, some players might be disappointed to see the countries in which it is restricted to gamble at Rise Casino. These include the whole of United States, a number of European countries like Spain, Germany, Belgium, and Denmark, as well as Antigua and Barbuda and Australia. The ultra entertaining software content at Rise Casino is supplied by a quintet of iGaming behemoths NetEnt, Thunderkick, IGT, NextGen Gaming and Eyecon. The lobby includes hundreds of slots, in which the online gambling destination is an absolute master. Specialising in the popular casino game, Rise Casino’s slot collection is continually on the rise. While the library does not include any other type of games with the exception of slots, they have made sure to truly cherry pick the collection and make it as perfect as possible. As we have mentioned, Rise Casino is a slot expert and shows off well over 300 slot titles that include both classic slots and video slots. All of them vary in genre, so lovers of adventure, romance, action, horror, fluff, fantasy and science fiction will all have something to look forward to at Rise Casino. Thematic and seasonal games are also there for you to enjoy. Classics such as Starburst, Berry Burst, Bloodsuckers and Bloodsuckers II, Finn and the Swirly Spin as well as newer additions like Pay of the Dead, Dr Jekyll Goes Wild and the branded Love Island slot are at your disposal. No table games are currently on board at Rise Casino. Other than slots, there are no other games in Rise Casino’s portfolio. We have not been able to find any live dealer games at Rise Casino, which might come as a surprise as this online gambling venue has pretty much everything else. However, this has not bothered as much – if at all – while we are enjoying the rest of the opulent offering. With Tay Affiliate, Rise Casino sorts out your banking business in the blink of an eye. The online gambling venue offers all of the most popular banking methods and prides quick and efficient service as well. The payment options that you can utilise at Rise Casino include ewallets like Neteller, Paysafe Card, PayPal and Entropay, as well as credit and debit cards such as Visa and Visa Debit, MasterCard, and even pay by phone option and bank wire transfers. Ewallets are processed in the time frame of 48 hours, and you will need to wait an additional 48 hours, which is the typical pending time. As far as other banking options go, you might need to hold on for up to 5 working days. Regarding withdrawal limits, Rise Casino does not strictly set up a limit on how much you can get paid out each month. The tender of currencies includes British pounds sterling, Euros and American dollars. To get in touch with this online casino’s professional and responsive customer service team, all you need to do is fill out the on-site enquiry form and you can expect a quick reply. The representatives are cheerful and friendly, and you will get a warm welcome from the team, as they respect their clients. Another way to reach out is by sending them an email to [email protected], and on their website they promise a reply within 48 hours, which is, honestly speaking, not that quick. However, the casino does encourage you to give them a ring if the matter at hand is urgent. That way you will get immediate assistance. The phone number you will need is 0800 018 3307. When emailing them, please bear in mind that you are strongly advised to exclude any banking information such as your credit card number or PIN, as this kind of communication might be intruded by a third party.